However consumers unlikely to step up their spending, as just 12 per cent believe their financial situation will improve in the coming year. 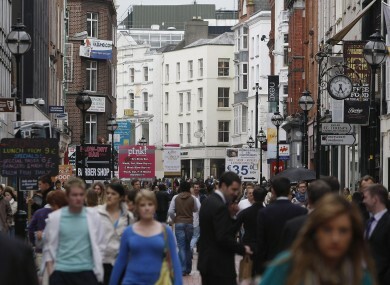 IRISH CONSUMER CONFIDENCE is rising, as the Irish economy stabilises and the rest of Europe begins sharing some of the burdens of the Euro crisis, according to the latest figures. The KBC Bank Ireland/ESRI Consumer Sentiment Index increased to 62.3 in June from 61.0 in May, bringing it very close to the six month high of 62.5 recorded in April. The figures were compiled before the EU summit in June. The number expecting a further worsening in their own financial prospects in the year ahead has eased from 63 per cent last December to around 45 per cent in the June survey. However, just 12 per cent believe their financial situation will improve in the coming year. Although there has been some improvement in early 2012, we remain some substantial distance from what might be termed a ‘normal’ recovery. However, uncertainty over the future of the single currency area combined with the near certainty of further budget austerity dragged down consumer sentiment in Europe. Over 440,000 people are now claiming social welfare, up 2,700 on last month’s figures. According to the Irish Small & Medium Enterprises Association, the government needs to start concentrating on its jobs promise and tackling the social welfare trap. ““Unless significant changes are made to the welfare system, many of the long-term unemployed will simply remain on the dole” said ISME Chief Executive Mark Fielding. The government’s plan for jobs is a shambles as the conflicting camps within cabinet propose polar opposite strategies, increasing economic uncertainty, consumer confusion and fear of investment. Email “Consumer confidence up in June ”. Feedback on “Consumer confidence up in June ”.